A labrador retriever is currently in training in New Hampshire where she will be an integal part of the Concord Police Department. A yellow Labrador retriever named Liberty is currently in training to become an integral part of the Concord, New Hampshire Police force. Liberty is going through "comfort dog" training at Hero Pups in Exeter and when she graduates, will be the first certified comfort dog used by a police department in the state. On Tuesday, state lawmakers got a special visit from Liberty as they considered a bill that would make it legal for Liberty to sit with victims, especially children when they take the witness stand in a courtroom. "Her main mission really is to help people who have been victims of violent crimes," said Concord Police Lt. John Thomas. Advocates for the bill included Rep. Skip Berrien who is a retired pediatrician. "This animal can mitigate the child's stress allowing the child to provide more accurate and credible testimony," Berrien told the committee. Thomas says when appropriate, Liberty will accompany officers to crime scenes, or even car crashes, though her job will be far different than that of a police patrol dog. "You have the dog that;s working, that's really trying to do real police work, sniff out drugs and find the bad guys, where Liberty, she's just going to lick you to death," Thomas explained. Rep. Anita Burroughs who used to have a therapy dog spoke to the committee in support of HB 513, appropriately named, "Liberty's Bill." "People who've never had a dog don't understand the full powers of a dog," Burroughs told NBC10 Boston. "I'm prejudiced, I think they're magical." Liberty will also play an important role back at the police station – providing comfort even for officers who didn't know they needed it. "Some of our big tough husky guys, when they first saw this dog they melted," Thomas said. "They never realized how powerful that the dog could be for them." Liberty's handlers say she's the perfect dog to be helping trauma victims — because she experienced trauma of her own. Last summer, when she was just nine weeks old, she was rescued from severe flooding in Pennsylvania and brought up to Hero Pups in New Hampshire. Opponents of Liberty's Bill say they're concerned the dog could snap at someone in a courtroom. 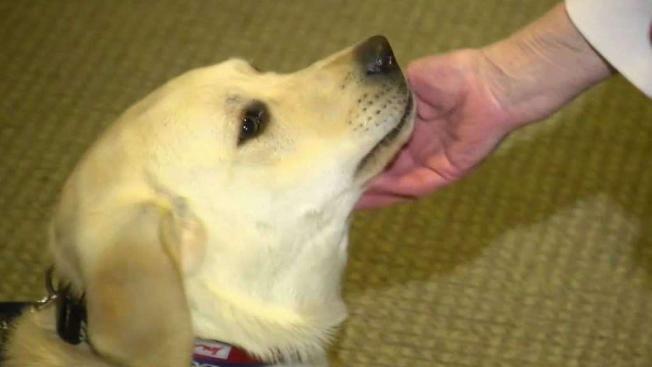 Regardless of how lawmakers vote on the bill, Liberty will join the Concord Police Department as soon as she graduates her comfort dog training in May.